On January 12 2018, Nottingham was having a particularly bad day. 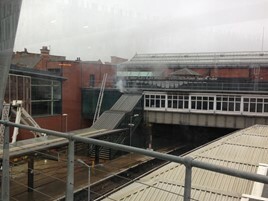 A murder in the city had resulted in the closure of part of the tram system, a power outage was affecting the other end of the system, two buses had collided outside Nottingham station and, inside the station, someone had started what became a major fire in the toilets. The arsonist struck at around 0620, and the resulting blaze meant that 200 people had to be evacuated from six trains and ushered out of the station. At this point, closely coordinated teamwork from all those responding was paramount to ensure everyone’s safety. Just three months before the incident, East Midlands Trains had reviewed its evacuation procedures. The operator reported the fire to the emergency services, who arrived to find such an efficient evacuation in progress that they included the railway agencies in the joint command structure. NRA judges commented that this was a rare statement of confidence in the competence of a site owner and indicates fresh thinking and behaviour. Once it was established that the only casualties were two railway staff who were affected by smoke inhalation, the objective was to avoid as much disruption as possible and to maintain communications with the public so they could amend their travel plans. Through the close teamwork of EMT, Network Rail, Nottinghamshire Fire and Rescue Service and the specialist railway knowledge of the British Transport Police, and despite £2 million of damage, the station reopened for business at 0500 the following morning. Judges said the whole exercise has been written up for the benefit of others, sharing the experiences of this incident, using the Joint Emergency Services Incident Protocol, which will reduce the risks associated with future incidents of this nature.